The Indians won their first sectional championship since 2003 with a 1–0 win over Rancocas Valley Regional High School in the Central Jersey Group IV championship game. 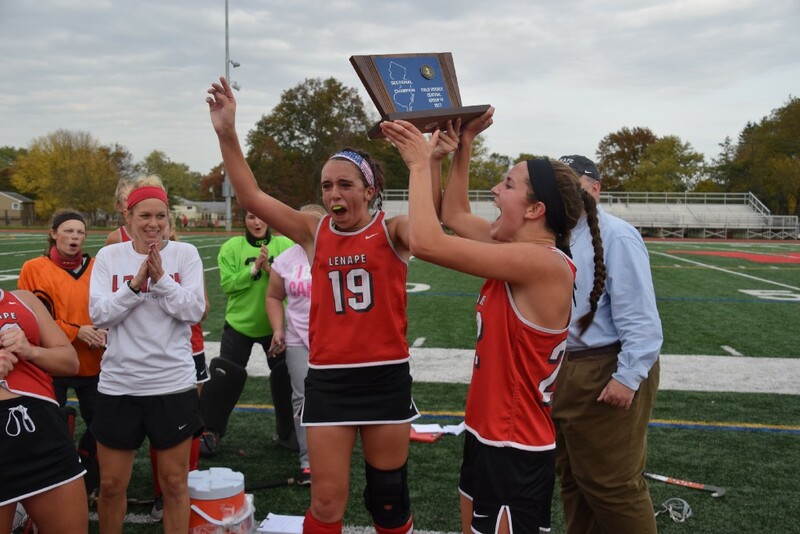 Captains Riley Grogan and Caroline McKenna celebrate with the championship plaque after Lenape won the Central Jersey Group IV title last Friday. 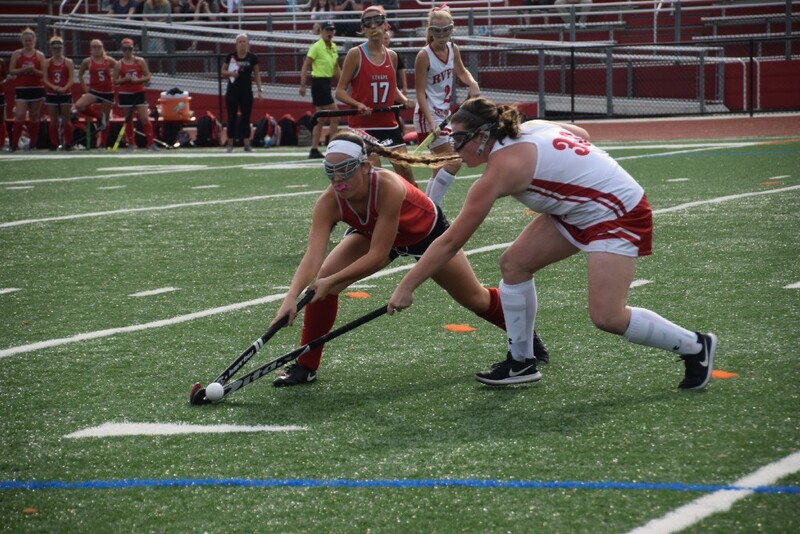 In just two years, Lenape High School field hockey has gone from the bottom of the standings to the cream of the crop in Central Jersey Group IV. In 2015, Lenape won just two games and went winless in Olympic Conference American Division play. Last Friday, the Indians completed a remarkable two-year turnaround when they defeated Rancocas Valley Regional High School, 1–0, to win the program’s first sectional championship since 2003. The №4 seed in the Central Jersey Group IV tournament, Lenape won back-to-back road games to clinch the title. The Indians stunned №1 seed Toms River North in the sectional semifinals, 3–1, before traveling to Rancocas Valley for the championship game. Prior to leaving for Rancocas Valley, Lenape Head Coach Sarah Moretti brought her team into the school gym to give them a little bit of motivation. “We brought them out and had them look at the (championship) banner and visualize 2017 up there,” Moretti said. 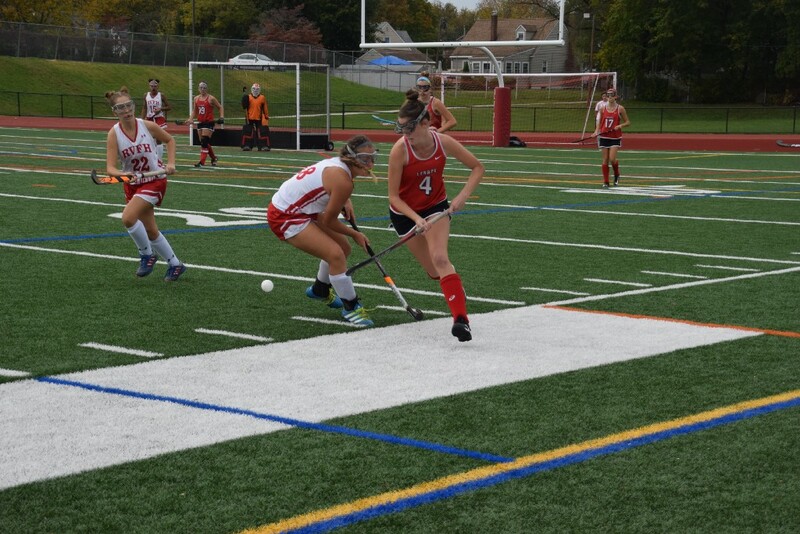 In the title game, Lenape dominated possession, outshooting the Red Devils 19–4. 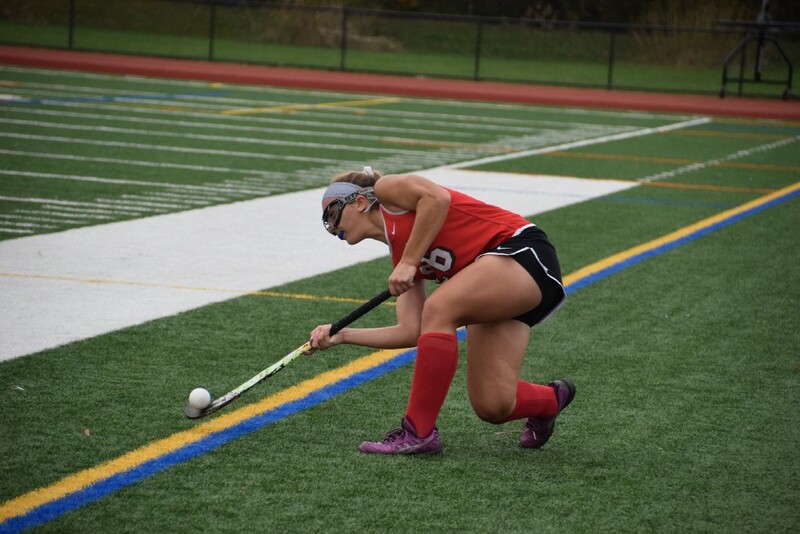 Sophomore Megan McKenna was a big part of Lenape’s success, controlling the middle of the field and preventing Rancocas Valley from breaking out of their own end. Megan McKenna plays the ball past a Rancocas Valley defender. Despite dominating possession, Lenape failed to score in the first half. Caroline Barlow lifts the ball into play for Lenape. At halftime, Moretti told her team to visualize being that player who would score the first goal. Early in the half, Barlow would end up being that goal scorer, deflecting a shot into the cage for Lenape’s only goal of the game. 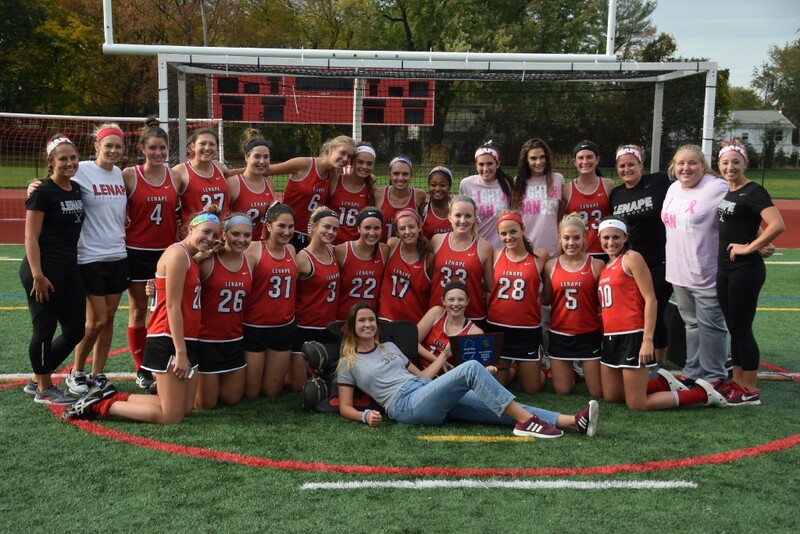 The sectional championship win pushed Lenape’s record to 11–10. While their overall winning percentage is lower than other sectional champions, it doesn’t account for the Indians’ remarkably difficult schedule in the Olympic Conference American Division with national powerhouse Eastern Regional High School and a perennially strong Shawnee High School team. While Lenape faces difficult foes in the regular season, the postseason features schools from entirely outside Lenape’s conference. The Indians were the only Olympic Conference team in the Central Jersey Group IV tournament this year. Kelly Bartolomeo battles for the ball in the second half. Lenape’s improvement in conference games this year allowed them to build confidence entering the postseason. Lenape won games against division foes Washington Township High School and Cherokee High School early in the year, teams Lenape has failed to beat in previous seasons. Moretti feels the girls were successful this postseason because of their commitment to improving. Lenape’s next game would be against a familiar foe, as the Indians are scheduled to clash with South Jersey Group IV champion and Olympic Conference rival Eastern on Tuesday in the NJSIAA Group IV state semifinals. Regardless of team’s result in states, Lenape’s players said the past season would be a memory they’ll never forget. “This is the biggest win we’ve ever had,” Caroline McKenna said. Visit www.mtlaurelsun.com for the results of Tuesday’s state semifinal game between Lenape and Eastern. Lenape High School field hockey celebrates with the championship plaque after Lenape won the Central Jersey Group IV title last Friday.